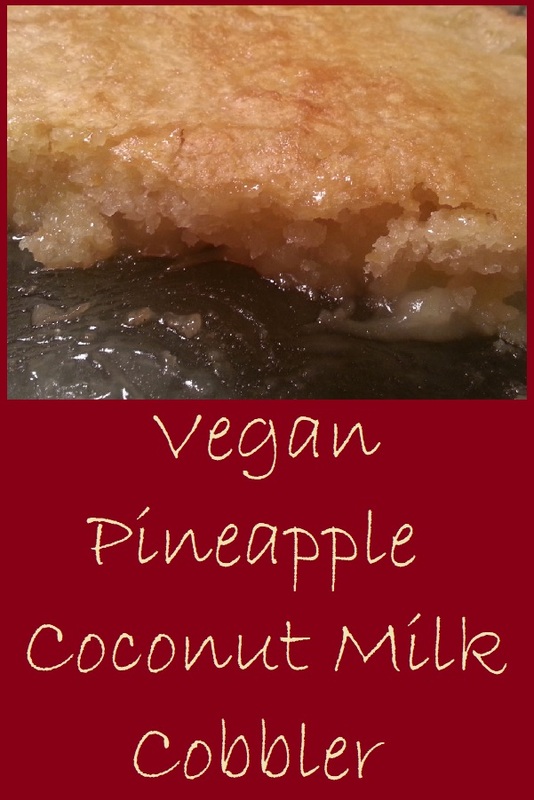 Pineapple Coconut Milk Cobbler is a simple and delicious dessert that goes together quickly, and bakes perfectly in the oven while you make the rest of your vegan meal on the stove top. The inspiration for this cobbler is our easy nectarine cobbler and our canned fruit cobbler. Neither of those recipes were vegan, so I decided to adapt the recipe to see how it would work without any animal products. When I realized that I would be using coconut milk, I immediately thought of a pina colada, so I chose a can of pineapple for my fruit. What will you need to prepare this recipe? 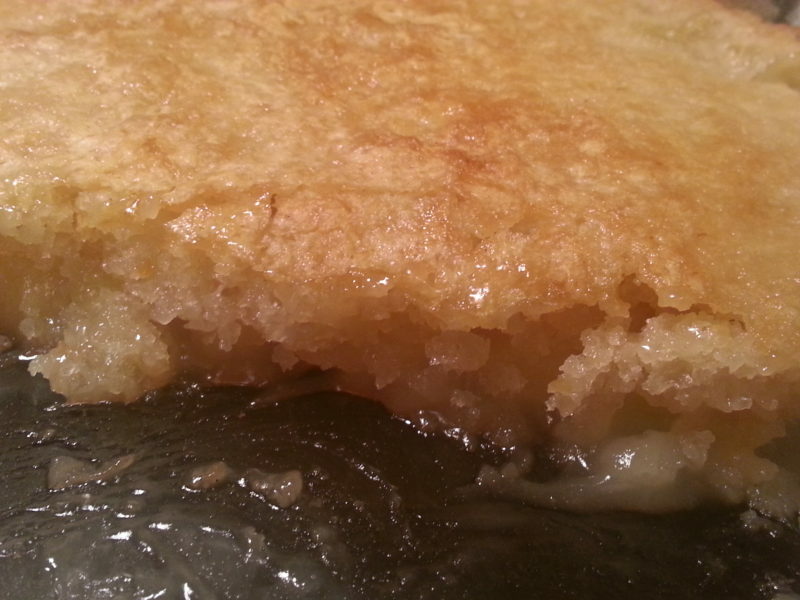 I mixed up my cobbler, but I had one small problem. I had anticipated using a can of pineapple tidbits, but all I had on hand was crushed pineapple. Continuing the Patty Cake’s Pantry tradition of doing what I can with what I have on hand, I made the cobbler with the crushed pineapple instead and crossed my fingers. 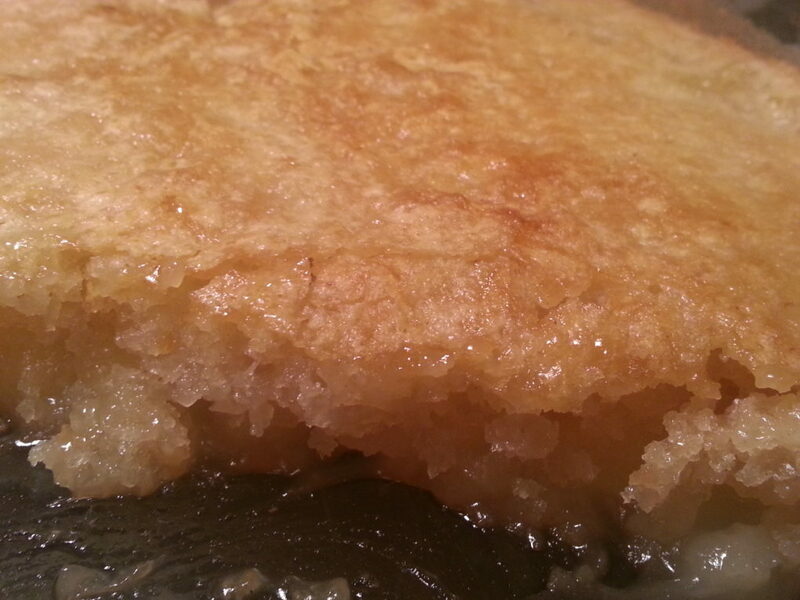 The pineapple coconut milk cobbler smelled heavenly as it cooked. Once it came out of the oven, we could hardly wait to dig in and give it a try. This recipe was perfect. Our only complaint was that we couldn’t really taste the coconut, so the next time we make this recipe, we will use unrefined coconut oil to add more coconut flavor to the finished project. We ate the cobbler warm from the oven, topped with coconut ice cream. It was amazing. In fact, it was so amazing that we forgot to take any pictures of the plated cobbler before it was gone. The crushed pineapple gave the dish a texture that was reminiscent of a baked pudding instead of a cobbler, but we have chosen to continue to call it a cobbler. Give our recipe for Pineapple Coconut Milk Cobbler a try and let us know what you think by leaving a comment below. A simple and delicious dessert that's easy to assemble, and sure to please. Cook's Note: If you don't like pineapple, you can substitute a can of peaches, cherries, or whatever fruit you have on hand. Prefer to use fresh fruit? Substitute 4 cups of fresh fruit cut into bite sized pieces taking care to remove any seeds or pits. The total cost of this recipe is $2.98 or about $0.38 per serving. Melt coconut oil in the bottom of a 7 X 10 inch baking pan. In a bowl, mix together 1 cup flour 2 teaspoons baking powder, and 1 cup of sugar. Add coconut milk to the flour mixture and stir until it's well mixed. Pour this batter into the baking pan with the coconut oil. Pour the can of pineapple, and the juice, on top of the batter. Sprinkle the top with ½ cup granulated sugar. Bake at 350 degrees for 55 minutes to 1 hour. The top will be golden brown. Nutrition information is for 1/8th of the cobbler prepared according to the recipe without coconut ice cream.